The entire seven-season run of Gilmore Girls became available on Netflix earlier this month. And that’s great news, because the ability to watch Gilmore Girls whenever you want to is one of the best reasons to have an Internet in the first place. Another good reason is to talk about shows like Gilmore Girls, which became increasingly convenient over the show’s 2000–2007 lifetime. Lorelai Gilmore (Lauren Graham, currently on Parenthood) is a single mother who had Rory (Alexis Bledel) when she was 16 years old. Possibly because they’re so close in age, they’re very good friends. But when Gilmore Girls starts, Lorelai’s rich, distant parents want to start getting involved in their granddaughter’s life. This kicks off some really rich, interesting relationships as Lorelai tries to repair her relationship with her mother Emily (Kelly Bishop, recently of Bunheads), who disapproves of pretty much everything about her but still eventually loves her. Lorelai’s father, Richard (Edward Herrmann, the head vampire from The Lost Boys and also a million other roles), is less disapproving but still quite traditional. Lorelai's relationship with her parents, Richard and Emily Gilmore, is one of the best parts of the show. Lorelai and Rory are both individual characters. Rory is the rare television character who is described as intelligent and then acts like it. In an episode in the first season, it is revealed that she brings a book everywhere she goes. That’s just good sense, but you don’t often see someone take a break from a high school dance to leaf through The Portable Dorothy Parker. Of course, because Gilmore Girls was an early–2000s show on the WB, there are romances. As Rory goes through high school and college, she has a few different boyfriends. There’s an obvious best choice, but I won’t say who it is because I don’t want to spoil the surprise. And because not everyone agrees on who the obvious best choice is. Lorelai’s romantic outings largely involve Luke, the owner of the local diner. Luke’s played by Scott Patterson, who you probably didn’t see in The Event. No one else did, either. Rory and Lorelai engage in snappy dialogue. Dialogue hasn’t been this snappy since the days of Howard Hawks. In this case, “snappy” mostly means “fast,” but it’s also very smart dialogue. Sure, it’s not how real people talk. But you can get realistic dialogue anywhere. People speak it all over the place. Sally Struthers is the quirky next-door neighbor, Babette. She fits right in in Stars Hollow. And the town of Stars Hollow, Connecticut, is full of interestingly strange people. Melissa McCarthy has become a huge movie star through her performances in The Heat and Bridesmaids, but here she’s Sookie the chef (not to be confused with the Sookie from True Blood), Lorelai’s unfailingly cheerful best friend. And she’s great in it. She’s probably fine on Mike & Molly, but it’s hard to imagine that she’s found a way to be more appealing than she was on Gilmore Girls. As with a lot of shows, Gilmore Girls fades a bit toward the end of its run. If all seven seasons had been great, it probably would have gone for an eighth and ninth and so on. But that doesn’t change how good the first few seasons are. Sookie (center) is Lorelai's best friend, with a great performance by Melissa McCarthy. And it you hate whimsy, that could be a problem. Because Stars Hollow is a town that’s absolutely slopping over with whimsy. Not only is there a town troubadour, but that troubadour is played by Grant-Lee Phillips. And even that wasn’t whimsical enough, so there’s also a competing troubadour played by Dave (Gruber) Allen. There’s also a charmingly wacky dance teacher and a persnickety town fussbudget. But this is only a negative for people who really hate whimsy. You can stand a little whimsy, can’t you? How about if it’s whimsy combined with characters that read Dorothy Parker for fun? At first, it’s Northern Exposure plus Alice. Later on, when Rory’s at college, throw some Felicity in there. Rory and her BFF Lane stay close the whole series, even though their stories diverge pretty wildly. It’s great. Really. It’s not easy to make a television show this charming without shading into the realm of the annoyingly twee. But Amy Sherman-Palladino and Dan Palladino achieved it here. Gilmore Girls earns its laughs and features real relationships that are interesting to watch play out. 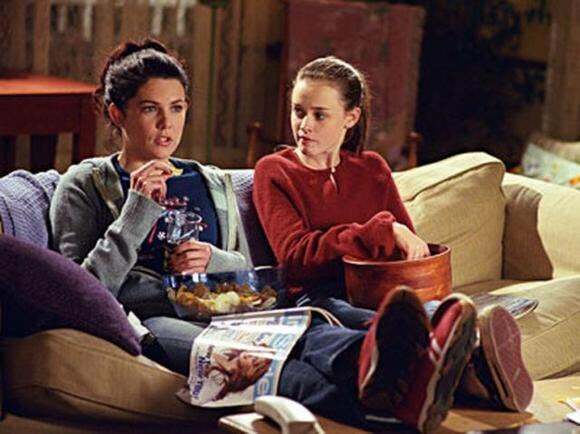 Although the center of the show is the pairing of Rory and Lorelai, there’s an argument to be made that Lorelai and Emily are where the really interesting emotional content is to be found. There aren’t that many sitcoms with even one relationship deep enough to investigate over seven seasons. A lot! This isn’t a show where you’re binging to get through it as fast as you can. This is a show where watching it is a joy. If your experience is anything like mine, start by blocking out three hours or so. Then look up, notice that the calendar has changed and you’re somewhere in the third season.